GOODFUNDSADVISOR: EDELWEISS MAIDEN OPPORTUNITIES FUND NFO - NFO FOR AN IPO!! 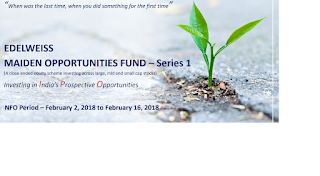 EDELWEISS MAIDEN OPPORTUNITIES FUND NFO - NFO FOR AN IPO!! NFOs keep coming dime a dozen. In fact, there is at least 1 single fund which hit the market every week. I choose to deliberately ignore all of them as every NFO is a copycat of one already existing in the Market. A Quality NFO with Strong name attached to it and one which has got something UNIQUE to offer comes along once in a Bluemoon and as and when it does it comes.....its then SRIKANTH MATRUBAI comes into the picture to write on it. Speaking to SRIKAVI WEALTH, the CEO of Edelweiss AMC, Radhika Gupta says “the fund aims to FOCUS on 25-30 Ideas from upcoming IPOs and recently listed ones too”. She explained that Unique Investment Opportunities that will come play out the India’s Growth Story are expected from Unlisted Sectors and recent new entrants to Stock Markets like the Life Insurance, General Insurance, Asset Management companies, etc. WHY TO INVEST IN THIS FUND ? One could argue that an existing fund too participates in an IPO is true but its also a fact that the Average Exposure was in a range of 1% to 2% max which is highly unlikely to make any significant impact on the NAV. With a dedicated IPO fund the exposure will be truly into the IPOs and one gets the opportunity to ride the IPO wave. Now...with its 294% returns..due to this less than 1% holding, the positive impact on the NAV will be next to nothing. 2. NOT JUST ENTRY BUT EXIT TOO! It is not just entering but EXIT that actually determines how much returns you have made. Fund being Close Ended actually works in favour of the Fund as the Fund Manager is saved from the hassles of investors redeeming (booking profits) and indirectly forcing the Fund Manager to avoid taking a LONG TERM. Close Ended funds tend to have less churning and hence scope for Lower Expense Ratio which ultimately could result in better returns. Access to Large number of Good Quality IPOs with limited money (as small as Rs.5000). In fact, some investors just to get allotment even go for Margin Funding which increases their cost of acquisition. A very strong pipeline of IPOs lined up in near future like HDFC Mutual Fund, ICICI Securities, NSE,NSDL, Hindustan Aeronautics, Reliance General Insurance,Bandhan Bank, Prince Pipes and Fittings , Achme Solar Holding Limited etc. 1. Since its a New Fund, there is no Track Record. 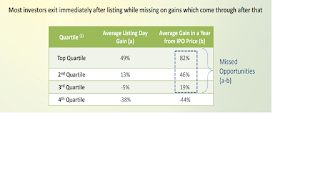 Moreover lack of quality IPOs may leave the fund Manager with little choice to deploy fund. 3. Since the fund is Close Ended, even the Fund manager will not get FRESH Inflows due to absence of SIPs and he will be helpless to invest further amounts of money in case of Quality stocks becoming available at cheaper prices dur to Market correction or otherwise. The rationale for my excitement towards this Fund is the space the fund aims to invest in....the IPOs. If you are ready to ride out the volatility and impressed with track record of Edelweiss AMC, then this fund is for you. Most of the so called “EXPERTS” blindly run down a New Fund Offer, however good it may be. In fact, they compete with each other in criticising an NFO. The actual fact that everyone misses is that even the BEST performing fund was once a New Fund Offer!!! Both these funds were given a POSITIVE opinion by me and these so called EXPERTS did not mention a word about these funds. In fact, SBI Small & Mid CapFund was given a MISS by all these so called EXPERTS. I had made all investors with appropriate risk appetite invest in this fund when its name was DAIWA INDUSTRY LEADERS FUND...an unknown name in the Industry. Those who followed the words of these so called EXPERTS are still waiting for returns...my readers and investors are laughing all the way to bank. EDELWEISS MAIDEN OPPORTUNITIES FUND looks to be best way to participate in India’s IPO Growth story. 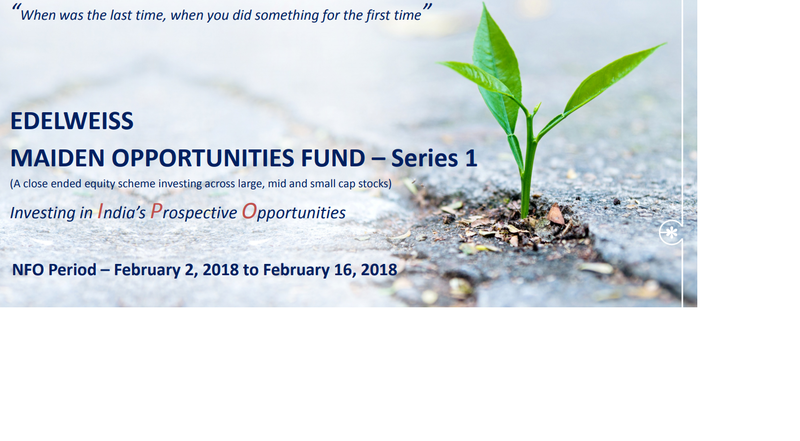 I will not be surprised if more Fund Houses come up with a Fund similar to this Edelweiss Maiden Opportunities fund..it is that good!! IPOs are not just Initial Public Offers but are truly India’s Prospective Opportunities and this fund will be a good way to participate in the same. Caveat : This fund is suitable for aggressive investors who have High Risk-Appetite and okay with the lock in of 3.4 years. Please read the Offer Documents carefully before investing. Please consult a competent Mutual Fund Distributor before investing. Standard chartered AMC NOW IFSC. HAD similar product was not successful.